Paula’s Post #98 — 1964, in the clip above, the great science fiction writer Arthur C. Clarke predicted ‘the future’. A future where it would no longer be necessary to commute to hold meetings. A future where individuals in diverse and sometimes remote regions of the world would nevertheless enjoy immediate interconnectedness with colleagues around the globe. I came upon this clip quite by accident but was amazed to discover, in retrospect, how eerily ‘prescient’ Mr. Clarke was about the society in which we live today. While I do not know for sure, I suspect that on this Thanksgiving Day in the US, while I am basking in the California sunshine, one eye on today’s NFL football game while simultaneously perusing Brussels sprout recipes on Pinterest and surfing the net for interesting blog content for today’s post, my 5writer colleagues will be similarly multi-tasking. 2500 kilometres to the north, in a suburban outpost of Vancouver, Joe may be googling “Pre-war Amsterdam” or ‘US Infantry flamethrowers” or “Mustard Gas” while the latest instalment of “Game of Thrones” plays out on Netflix and the alarm on his iPhone reminds him he must put on his muck-lucks soon to pick up ‘the Oldest’ and ‘the Youngest’ at school, a new routine for new step-dad Joe. A few miles further north and just across the river, Helga may have her iPad open on the kitchen counter, Skyping with her mother in Vienna. I imagine her chatting with her 92 year old mother, as she does every day, about the weather in their respective cities, or inquiring after old family friends, or perhaps confiding about the challenges she is facing in making all her beautiful artwork fit in their new home after a recent downsizing move. But Helga, too, may well be multi-tasking while she chats, laptop open before her as she checks out incoming email, or facebook. Across town, I bet Karalee has her laptop open too. She’s had her nose to the proverbial grindstone lately, right in the midst of a gruelling,12-week online writing course she’s taking on first draft plotting and character development. But none of us live in splendid isolation, and I know Karalee has a busy life with a husband and three kids. So I suspect she is also keeping up with a flurry of text messages from the kids, while figuring out what to make for dinner and simultaneously emailing all members of her hiking group about the location for this weekend’s hike. All possible without ever leaving the table. All possible without picking up the phone or opening her mouth to speak. And Silk? Our transplanted Yankee? Maybe she’s cooking a big turkey dinner over on bucolic Saltspring Island. If so, perhaps she’ll give it a good pesto rub with the fresh basil pesto she put up last summer, or use some of those home-grown apples for the stuffing. But if that all so sounds oh so 20th C to you, do not fear. Knowing Silk, she will already have perused a dozen writing blogs and be emailing us with the latest tidbits on indie publishing. Or maybe she’s working on her review of Larry Brooks’ ‘Story Engineering‘, which I think she plans to use as some kind of ‘hall pass’ to get out of actually outlining the novel she is about to embark on. Oh, and knowing Silk, she’ll also be right in the midst of resizing jpegs and choosing fonts for the latest edition of the Sailing Club Newspaper. I haven’t seen most of my 5writer colleagues for over two months, but thanks to the power of the internet, I bet I have a pretty accurate picture of how they might be spending their day. All these marvels may seem common place to us now, but fifty years ago in 1964, when Mr. Clark made his bold predictions about ‘the future’, American Thanksgiving was the ‘starting gate’ for my parent’s annual Christmas card binge fest. A four week stretch in the run-up to Thanksgiving where they’d sit down at a card table in the living room and spend hours each evening crafting hand written, personalized, chatty ‘Christmas Cards’ to a list of friends and families who’s contact details were carefully entered into a special little address book. The ‘list’ stored with boxes of left over cards in the closet under the stairs. Ready for next year. In 1964, the writing and receiving of Christmas Cards was a ritual of communication equivalent to today’s internet communication via email, facebook and Twitter. It is how we checked on the health of old friends, shared news of children, promotions, vacations, moves and marriages. Some even used a mass form of this medium, enclosing the ubiquitous, mimeographed ‘Christmas Letter’ so mocked by my witty mother. I recall my Mom, upon receiving one of these chatty communications, would spend hours composing ‘replies’ – hilarious parodies where she’d counter her friends boastings of their husband’s promotion to ‘Second Assistant Regional Sales Manager’; or ‘Susie’s handsome letterman prom date’, or ‘Carl’s third-place swimming trophy’ countering with her own albeit ‘fake’ revelations of the dramatic ‘news’ in our family which usually focused on some unwanted teen pregnancy, hooliganism or other harrowing misfortunes. She never sent these replies, but my mom could be pretty damn funny at times. She came from a family where you were brought up to believe it was wrong to boast about your achievements. Wrong to engage in boorish ‘my-child-is-clever-than-your-child’ gabfests. God knows what she’d think of the endless photos on facebook of children’s soccer trophies and dance recitals… or the endless photos of hubby’s new Jaguar or Porsche… the suite the Ritz Carlton where the Jones stayed while on their anniversary trip to the Big Apple. Yes, times have changed. If I received a ‘Christmas Letter’ that made me laugh and if I was in a spiteful mood, I could, with a click of my mouse, forward the offending letter to my entire address book. Boom! Done. But a revolution in social communication is not the only revolution wrought by the internet. As Joe’s post of yesterday on ‘Researching Characters’ reveals, we are now in an age where Joe can, with a few taps of his fingertips, learn what uniform his character would would have worn in the Great War. He can research in minute detail where the wool was woven, he can find images of the doughboy’s rations and even create a lexicon of era-appropriate slang. In short, his work is a lot easier than say, Mr. Hemingway’s, who had to actually sign on to be an ambulance driver, get shelled by artillery and spend days recuperating in a field hospital to know what shrapnel wounds felt like. This is no slight to Joe. Just a simple illustration of how easy we now have it. Easy, and at the same time difficult, for the internet is like a vast smorgasbord, where new dishes never stop coming. At some point, we must push away from the table and write. Here, maybe Mr. Hemingway had the advantage. No laptop, no email, no facebook, no twitter. No Skype, or FaceTime, Pinterest or Instagram. No iphone. No text messages. Just a keyboard. A keyboard, his imagination and a blank piece of paper. Hey! I bet you won’t guess what I just found? Did you know there is a website called myTypewriter.com ? 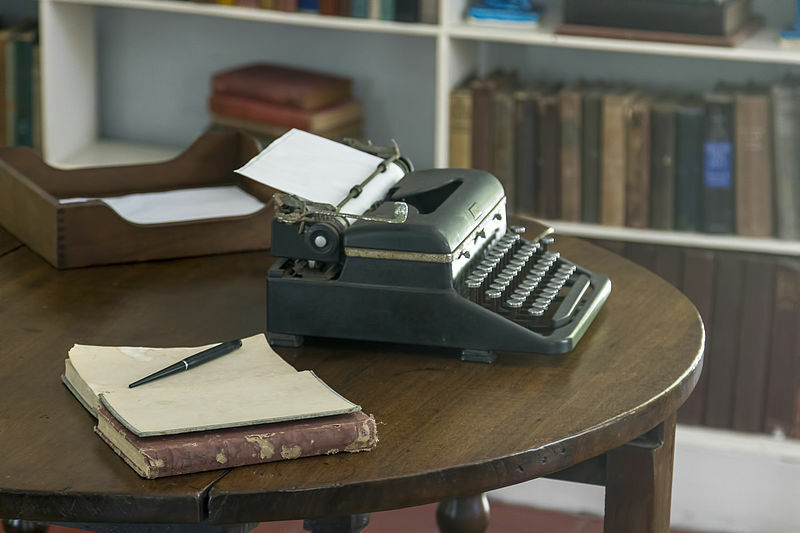 Started in 1974, it’s an ongoing project featuring the lives, works, and typewriters of the most outstanding authors around the world including, of course, Mr. Hemingway. 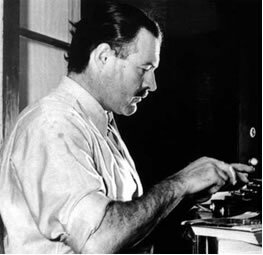 Oh, and in case you were wondering, i took me about 3 seconds to find photos of Mr. Hemingway with his typewriter. Maybe 40 total to find a royalty free image from Wikepedia Commons, of a Hemingway typewriter with a blank page in it. My question for next week? Are we better writers? Or just better researchers? I’m thankful for my loving husband, for putting up with me. I’m thankful for my wonderful stepkids and grandkids, who live too far away but send such great photos and movie clips of the kids and whom I hope to see ‘in person’ soon. I’m thankful for the talent, camaraderie, hard-work, unselfishness and honest feedback from my 5writer colleagues, and yes, for the ability of the internet to keep us feeling like ‘a group’ scattered though we are. I’m thankful for the many ‘gifts’ of kindness from my many friends and family throughout the year. I’m thankful for good health. And I’m thankful for never being bored, even though, sometimes, then internet means I don’t get as much done as I think I am going to get done. Oh… and did you know Angelina Jolie wanted to buy a Hemingway Typewriter for Brad as a wedding present? It must be true, I read it on TMZ! Best Show Last Week – Check out Chicago PD. A fast-paced and driven cop drama. Book That I’m Reading At the Moment – Tamar – Oh I have some things to say about this one! # Turkeys eaten – only a little bit of one… more today. I nominate this for best blog post title of the week — maybe of the year! Very insightful musings on our modern connectedness. BTW, no turkey yesterday, but I did work out at the gym, go to 2 appointments, clean the house, clock in some online time, write a meeting report, and do a product photo shoot before I cooked a chicken dinner. One of the things I was thankful for last night was a comfy bed! Like you, I have a lot to be thankful for — including my very dear writing buds — and I try to think about that every day.